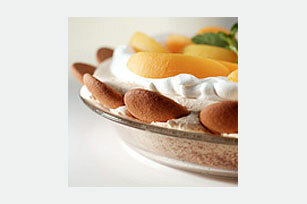 Meringue blended with vanilla wafer crumbs is baked in a pie plate, cooled and topped with whipped cream and peaches for an airy, delicious dessert. Crush 28 wafers finely. Beat egg whites in large bowl with mixer on high speed until soft peaks form. Gradually add sugar, beating until stiff peaks form. Add wafer crumbs, baking powder and 1 tsp. vanilla; stir gently until blended. Spread onto bottom of 9-inch pie plate sprayed with cooking spray. Stand remaining wafers around edge of pie plate. Bake 1-1/4 hours or until egg white mixture is firm and lightly browned. Cool completely. Beat cream and remaining vanilla in small bowl with mixer on high speed until stiff peaks form. Spread over pie; top with peaches. Save 50 calories and 8g of fat, including 4g of sat fat, per serving by omitting the vanilla, and substituting 2 cups thawed COOL WHIP Whipped Topping for the whipped cream. For fluffy beaten egg whites, make sure the bowl and beaters are thoroughly clean without a trace of fat or oil on them.